It doesn’t take three Corvettes to get to Martha’s Vineyard off the coast of Massachusetts. One car is sufficient to carry you from Woods Hole by ferry across Nantucket Sound and down the narrow, winding roads that follow the shoreline and thread the woods and meadows of the island. But our trip, which we’d planned as a quiet offseason vacation to one of New England’s loveliest destinations, became a full blown travel operetta with its own cast of characters and extravagant sets. 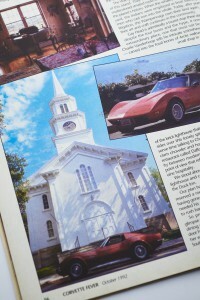 If you’re a Corvette Country correspondent, you’re expected to procure a Corvette for your trip. Now that can be a problem right there, especially if you don’t happen to own one. Our local dealership was generous the first time we proposed to borrow one of their vintage cars to wander the back roads of New England in the fall. General Motors was pleased to furnish us with a spiffy late-model car for our piece on traveling in Canada. Now we had a third assignment but, unfortunately, no Corvette. Right about then our son stopped through on his journey from the West Coast. He invited his old school friend Alan Yanski for dinner and we got to talking, and it happened that Alan had a friend who owned a Corvette, and he’d probably be glad to lend it to us for our trip, which is how Bill Diversi of Concord, New Hampshire, got involved in our Martha’s Vineyard caper and why, at 8 a.m. on a beautiful Tuesday morning in September, Charter and I started off toward Cape Cod in Bill’s elegant 1972 aroon machine. I liked this car. It had a back window that could be popped out and stored behind the seats. Our luggage and cameras fit nicely below it. The steering wheel was adjustable, and it had a sun roof. We opened the windows, turned the radio up and sped down the highway, across the Bourne Bridge to Cape Cod, coming to a stop just south of Falmouth at the Woods Hole ferry. Even in the off-season it’s wise to book passage ahead of time. We had our tickets and got in line to wait for the 12 o’clock boat. Business is slower on either side of the summer season; there’s time to talk and visit. We fell into conversation with Tim Silvia, whose job it was to take tickets and answer visitors’ endless questions. Coincidentally, Tim was a Corvette owner himself, and he was curious about our car. We traded stories until it was time to board the ferry. We got back into the car and turned the key. Nothing. We fiddled with the gear lever. Still nothing. The battery was charging, the lights and the radio worked, but our car would not even turn over. “Yeah,” said Tim. “A lot of 1972s have that problem. The starter gets heated up. Just let it sit for a few minutes.” The rest of the vehicles moved around us into the hold of the ferry. We tried again. Nothing. A young man from Alabama appeared at our side. “I’ve owned a few Corvettes. Can I help?” We popped the hood. Charter lay on his back under the car, shouting up reports as I tried the key. Tim and the guy from Alabama traded theories. Charter had a suggestion about the ground wire from the starter. The ferry was leaving, but we weren’t on it. Gulls hovered in the bright sky. The parking lot was empty. The island shimmered in the distance, just a few short miles away. Tim was beginning to take our dilemma personally. “There’s a Chevy dealership in Falmouth,” he told us. We called a tow truck and rode back to town in the cab, our Corvette trailing behind. We left the car with Service Manager Don Martel in hopes that his mechanics would be able to divine the cause of its malady; we caught a cab back to Woods Hole. All the arrangements had been made for our Corvette vacation. We only lacked one thing. “I’m not working tomorrow,” Tim told us. “If you need me, give me a call. I’ll bring my car over for you.” Tim’s kind offer was one solution, but it presented certain logistical problems. Thanking him and promising to call, we caught the 2 o’clock boat to Vineyard Haven and arrived in the sloop-studded harbor on foot. Late September is the perfect time to visit Martha’s Vineyard. The weather is gentle and the residents are returning to quieter lives. Shops have “Sale” signs in their windows and the cafes are uncrowded. Rooms at the hotels and inns are available at moderate rates. That night we were booked into the Ship’s Inn in nearby Oak Bluffs. We set our luggage on the sidewalk and considered the situation. The maroon Corvette might be fixed by morning, but much time would be wasted retrieving it. Tim’s red Corvette would photograph nicely, but there remained the problem of three people and gear in a two-seat sports car. We agreed that finding a Corvette and a willing owner on the island would be the ideal, if unlikely, solution. Enter the staff of the Chamber of Commerce. Their small bustling office at the top of a steep flight of stairs looks like a command center with its phone and computers and racks of island maps and brochures. Randy Vega was expecting us, ready to give us whatever assistance we needed, but she certainly wasn’t prepared for our unorthodox request. Could she locate a Corvette for us to drive and photograph? She registered surprise but hardly missed a beat. “Angel,” she called to a woman in the other room, “who do we know who has a Corvette?” Angel paused a moment, then remembered. “Les. Call Les!” Yes, Leslie Leland, pilot and proprietor of Leslie’s Pharmacy on Main Street, was the proud owner of a 1988 hatchback coupe; and yes, Mr. Leland would agree to allow us — two complete strangers — to drive his prized possession on a tour of the island tomorrow. First Bill Diversi, then Tim Silvia, now Les Leland. This spontaneous generosity was a marvel. We would have our car in the morning. But we had to get around with our suitcases and photographic equipment until then. So we walked a block down the street and rented a wreck. Martha’s Vineyard is a well-supplied island with a full complement of groceries, clothing shops, hardware stores and rental car agencies. But since we’d soon be riding in style, we felt we could settle for basic wheels for one night. Rent-A-Wreck leased us a little Chevette with questionable brakes and a reluctance to shift into third gear, and we headed for Oak Bluffs. Picture the typical New England fishing community. Shingled salt boxes. Imposing captain’s houses overlooking the bay. Lobster traps sunk beneath bright buoys bobbing among trawlers and pleasure boats. The sounds of sea birds and foghorns. Now drive into Oak Bluffs and find your preconceptions challenged by an altogether unexpected scene. This community grew around a Methodist revival campground called Wesleyan Grove that began in 1835. The faithful came here summer after summer to worship and share their common interests. They lived in tents surrounding a central tent that eventually became a permanent steel structure in 1879. The little tents gave way to more permanent houses, and their owners set to outdoing one another. The result is an antic collection of gingerbread cottages, painted within an inch of their roofs in green and purple and pink, flounced with porches, graced by gables and hung with potted plants. The campground, though no longer a Christian sanctuary, is jealously tended by a cadre of loyal summer residents who water the tiny lawns and touch up the garish paint. We walked the narrow streets of Oak Bluffs, marveling at its architectural fantasies, soothed by the liquid notes of a carillon piping a gentle hymn into the gathering shadows. It had been a very long day. We had a satisfying sandwich and a glass of beer at Stanley’s restaurant and checked into our accommodations. The room at the Ship’s Inn was spare but comfortable; our host was eager to answer our questions about the area. From him we learned about The Flying Horses Carousel, the oldest still in operation in the country and a historic landmark we’d visit the next day. For this night, however, the most exploring we’d do would be the streets of Edgartown by lamplight; the only map we’d consult was the menu at L’Etoile, a French restaurant tucked into a cozy corner of The Charlotte Inn. Built in 1860, the inn was once a sea captain’s home, and L’Etoile is one of those establishments that’s dedicated to making a meal memorable, from the quality of its service to the imaginative wine list to the distinctive character of each dish it presents. We chose a pheasant pate and a smoked whole quail as appetizers, accompanied by a crisp Chardonnay. After the salad course, Charter ordered the pan-roasted veal with sweetbreads, spinach and pine nuts. I had a perfectly prepared lobster dish sautéed with a rock shrimp custard, cognac and scallion sauce. Our meal was enlivened by a conversation with an architect and his wife at a neighboring table. The chocolate confection Charter and I shared for dessert, along with a snifter of Calvados, combined to make this one of those evenings that cause one to forget life’s trials and tribulations. And, according to our dinner companions, retiring to one of the elegant rooms at The Charlotte Inn would have been equally rewarding. We had breakfast in a local diner in Vineyard Haven, then pulled our rent-a-wreck into Les Leland’s parking lot, next to his newly washed car. We introduced ourselves, traded our keys for his (he might need a car today, and we assured him he could make unlimited use of ours), and eased our chariot into drive. Back in the classy saddle again! Les’ car was a joy. It had more road clearance than other Corvettes we’ve driven. The seats were roomy and the luggage space, thanks to the hatchback, was ample. It was equipped with dual roof panels and a four-speed automatic. Like enthusiastic teenagers, we pushed all the buttons on the Delco-Bose sound system and just barely resisted the ones on his cellular phone. And once again we noted the remarkable generosity of Corvette people. We returned to Oak Bluffs to photograph the car in its Victorian setting and ride on The Flying Horses Carousel. We stopped at the East Chop lighthouse, one of the five lights on the island, each with its own proud history. Then on to Edgartown with the stately Federal and Greek Revival houses of retired sea captains. South Water Street presented the erstwhile mansions of illustrious men, including that of Captain Valentine Pease, master of the ship on which Herman Melville made his only whaling voyage. At the wharf, headquarters for the annual Bluefish Fishing Derby, I felt that our sleek white Corvette, with its careful styling, was a match for the Yankee-crafted lobster boats and graceful, hand-built yawls that rode at anchor in Edgartown harbor. We continued on through a country landscape to West Tisbury and along the South Road to Beetlebung Corner in Chilmark. The “up-island” side of Martha’s Vineyard is hilly, rural, reminiscent of another time. Cows and sheep graze in stone-littered pastures. Gray-shingled houses recline in wooded pockets. There are few stores and sparse com¬munities on the road to Gay Head at the western end of the island. The Wampanoag Indians were the original inhabitants of this island. They lived around Gay Head cliffs whose multicolored striated rocks chronicle 100 million years of the planet’s history. When the whalers sailed off the Vine¬yard, the Indians were employed as boat steerers, the men who cast iron into the whale. Today, after years of litigation, the Wampanoags own their land again, and their art and craft continues in the community. Gay Head is admittedly a tourist stop these days, but despite the tour buses and the hype, it remains an extraordinary place, one that must not be missed. Charlie Vanderhoop sells his intricate scrimshaw creations — carved into the fossil bones of Arctic walrus — from a small shop in the shadow of the brick lighthouse that presides over this lonely spit jutting into the sea. We spent some time talking to Charlie and ate a great lunch of fresh clam chowder and homemade falafel at a little outdoor restaurant called Daffodil’s. I decided that there’s an affinity between modern Indian culture and a certain Sixties point of view that relishes good art, good cooking and genuine hospitality. We stood above the legendary cliffs, photographed the lighthouse and continued back down Lighthouse Road to the Duck Inn. Our plan had been to spend the night up-island. We’d reserved a room at the Duck Inn. But the best-laid plans having gone awry, we decided simply to visit this time. Les needed his car back by morning, and we weren’t anxious to rush back to the ferry at the crack of dawn. So proprietor Elise LeBovit graciously offered us a glimpse of what we missed: a spectacular ocean view, the dining room with its fireplace and grand piano, the outdoor hot tub, the path to the beach. The house is filled with her eclectic art collection: antique Japanese kimonos and Southwestern pottery. The airy guest rooms, some with balconies, are imaginatively decorated. Elise offers her visitors gourmet health breakfasts as well as massages and facials. The Duck Inn is an altogether unique spot to escape to. Back in Vineyard Haven, we reluctantly traded Les’ Corvette for our humble rental, and I settled into our cozy room at the Hanover House while Charter drove to Oak Bluffs to buy spirits for our dinner. Only Oak Bluffs and Edgartown sell liquor, but all the island’s restaurants permit you to bring your own. The Black Dog Tavern was a relaxed and friendly place to dine. There we had the best smoked bluefish we’d ever eaten, along with ample salads and a very good seafood curly. After a complimentary breakfast on the porch outside our room, we walked to the ferry in the warm morning air and, with the kind of luck that seemed to follow us on our trip, found a friendly man going off-island for the day who agreed to drop us at O’Hara Chevrolet in Falmouth. Don handed us the keys to our abandoned Corvette and a bill which, including the tow, was incredibly low. They’d replaced some wires from the starter to the ignition and the car started right up. When I’d spoken to Tim the day before and told him we didn’t need to take him up on his kind offer, he’d sounded disappointed. “Then how about meeting us in Falmouth,” I’d suggested. “We’ll photograph your red car against the sea.” And so we did, adding his 1975 L82 coupe to our gallery. Next, lest the unfortunate maroon machine be excluded from participating in our operetta, we parked it on the town green where it shared the sunlight with a 17th-century Congregational church. No one would willingly opt for a vacation that included a tow truck. None of us schedules minor disaster into our plans. Often, the smallest hitch in an agenda creates panic and misery. But tilt the unexpected on its comic side, trust in the inherent generosity of strangers and life selves up the most fascinating dishes. 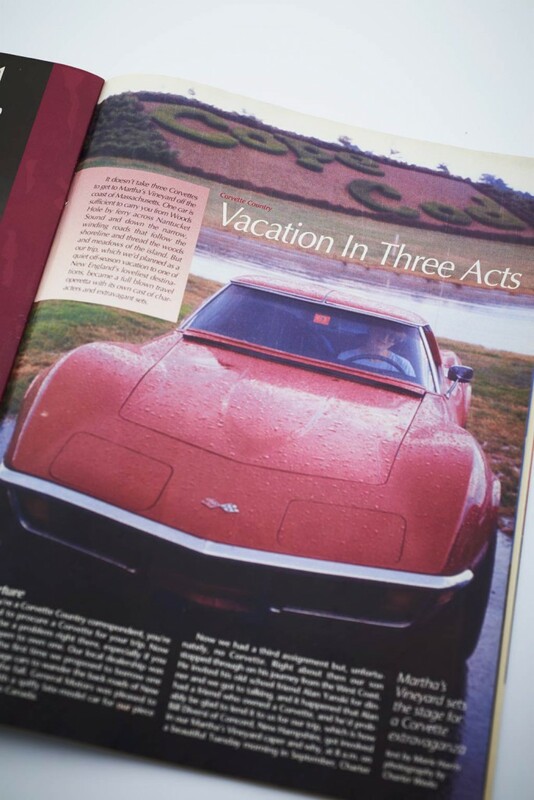 No, you don’t need three Corvettes and a cast of thou¬sands to orchestrate your trip to Martha’s Vineyard, but as we discovered, should you need them, they are there, smiling and even pleased to have a role in the drama. Corvette Country is filled with terrific people. CF —Freelance writer Marie Harris is a New Hampshire resident. She and her photographer/husband are partners in an industrial advertising agency. I live on MV,inEfgartown. Also,I own a ’07 Vette. I learned some about the island. Thanks for the story. 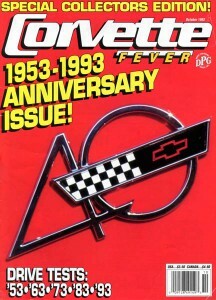 Our adventure happened a while ago (and Corvette Fever Magazine is no more! ), but I’m glad you found it still interesting.